Today I'm reviewing a piece of kit I have been using on and off for about 3 or 4 months now. It's a new headlamp I purchased in Autumn last year, the Black Diamond Storm Headlamp. Overall, I have been pleased with it, so let's take a closer look. Overall, a functional and sturdy headlamp. It's been performing well for me when out hiking at night. It fits well and is easily adjustable to fit your head size. I bought the Black Diamond Storm Headlamp last October in a bit of a rush as my old headlamp had stopped working properly and I needed something for a camping trip I was going on. I had a good experience with the Black Diamond Spot Headlamp so I thought the Storm would be a good investment. Offering 250 lumens of light in the max setting, I was happy that this would cover most if not all of my hiking needs. The product also offered that the max setting would be maintained for a period of 60 hours at the higher performance levels i.e. with full beam. That was appealing but from experience, I am never entirely convinced with those kind of promises. The Storm comes in multiple colors (Aluminium, Olive, Nightshade, Octane and Matte black), I went with the matte black option and it is the one you will see in the photos in this review. Starting with a features overview, the Storm comes with 1 Quad Power LED and 1 Double Power white LED which emit up to 250 lumens on max setting. The Storm also features red and green single power LEDs for night vision modes which also have dimming and strobe settings. The LEDs also have a memory function so it stores the brightness level you were last using. All of these options are operated using a single power button on the top of the headlamp. This is a feature I was accustomed to in the my old Black Diamond Spot Headlamp and is something about the headlamp I really like. Let's look at how it works a bit more below, I'll try and walk you through how it works. First off, the headlamp can be locked. By that I mean when you hold down the power button, from the headlamp being 'on', for 5 seconds, the battery power light, on the bottom of the headlamp, at the top of my finger in the picture below, will flash blue and go off. This means you've locked the headlamp out of active mode. What's so good about that? When your headlamp is in your pack, it can get moved about quite easily. As that happens, the power switch can be hit which could potentially turn the headlamp on. The lock feature ensures that your headlamp won't come on by accident with one unfortunate bump of the button. As you need to hold it down for 5 seconds, it is highly unlikely that it will come on by accident and drain your batteries. The same gauge in the photo above, where it flashes blue to indicate it is locked, also acts as a battery charge gauge when the headlamp is on. This means you can see how your battery life is doing i.e. it will show amber, red, etc. depending on how much battery juice is left. To continue on with how the headlamp works, if I want to turn the torch into active mode, as mentioned above, I hold the power button down for 5 seconds. The blue power light in the middle flashes again indicating it is locked but by holding it down the headlamp eventually flashes once indicating the headlamp is in active mode. When I depress the button, the headlamp switches off. Now the lamp is in active mode, if I hit the power button once more, the main headlamp will turn on. If I hit it once again, it will go off. It won't lockout unless I again hold the power button down for 5 seconds and get the blue power light to flash. This is handy as I want to be able to use it with one touch when I am actually using it and not run the risk of losing battery power when not using it by locking it. I like this feature as it is very practical and sensible. Continuing on from that, in active mode, nearly all the settings to the various light features are all operated from that one power button, as shown again by my thumb in the picture below, on top of the headlamp. I'll run through them now one after another. If I turn the headlamp on by clicking the power button once and then hold the power button down again, the strength of the spot beam moves up and down. When it moves into the more powerful beam strength, a second lamp comes on at the left side of the headlamp. When I find the desired beam strength, I just let go of the power button and the main spot beam will stay at that strength. To access the red night vision function, click the power button from the off position and hold down for 2 seconds. When the red light comes on, release the power button. To change the power of the beam, again hold the power button down while in night vision mode and it will move up and down in brightness. To turn off and go out of night vision, you just hit the power button once. To access the green night vision function, you more or less do exactly the same as you do to access the red night vision beam, but you click twice from the off position rather than once. Again, to change the power of the beam, just hold the power button down while in green night vision mode and it will move up and down in brightness. To turn off and go out of night vision, you again just hit the power button once. To switch between green and red, push the power button quickly twice. There is a strobe feature which is available in either of the main beam or red/green night vision settings above. From an off position in the desired mode, tap the power button three times in quick succession and the strobe feature will turn on. Handy for emergencies or to draw attention to your position. I don't want to go into the step by step functional instructions too much, that would be boring 🙂 and they are easily available to you when you get the lamp. The diagrammatic instructions that come with it make it very easy to follow. The main thing I hope to illustrate is that most of the functions on the headlamp are easily operated from the one main power button at the top. This was the same with the Black Diamond Spot headlamp so I was used to it but I do really like this function. I think it's very easy to learn how to use. You will see more of this in the video below. The next thing I should mention is something called 'Power Tap Technology'. The idea behind this is that on the right side of the lamp itself, there is a little button which is activated by touch. When the light is on and you tap it and release, the lamp will be brought to 100% brightness. Tap it again and it will revert to the previous brightness. This is handy if you only need 50% light on a very clear and open trail but then maybe hit a more difficult piece of terrain and want to switch to full power easily and quickly. I found it tricky to manage using gloves though. 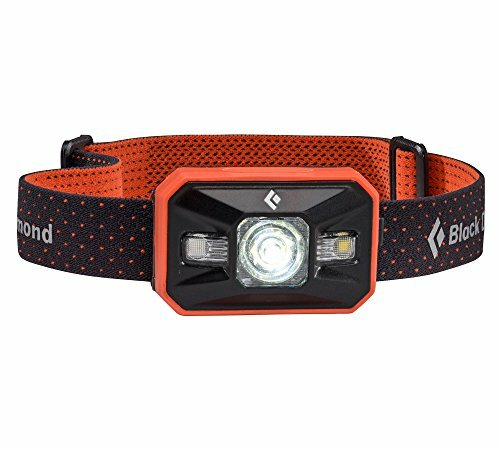 The Black Diamond Storm Headlamp sits on a stretchable band / strap that can be adjusted to fit your head size. I generally found this comfortable with or without a hat. You can see the strap adjusters in the picture below. They're easy to adjust, even with gloves on. Another nice feature on the headlamp, in terms of comfort, is the padding on the back of the area that rests on your forehead, as shown in the picture below. It feels pretty good against my skin when I don't have a hat on, and overall the headlamp rests comfortably on my forehead in terms of fit with no signs of chaffing or the like. As with any decent headlamp, the lamp itself sits on a pivot to enable you to move it to point in different directions, as shown in the image below. It has five positions, the first being totally horizontal and as you move through each one towards the fifth and final position, the lamp points downwards in front of you more and more. This is handy to focus on a map or the ground immediately at your feet in a tricky area. Generally speaking, when hiking at night, I keep it looking towards the ground most of the time, maybe not in the final position towards the ground, but close to it. Overall, I found the Black Diamond Storm Headlamp very functional easy to work with. I really like that everything is operated through the one main power button at the top. This is neat and easy to pick-up. It took me only a couple of run through's with it and I was happy to take it out on the trail at night, comfortable with how to operate it. Nothing complicated or confusing in terms of switching beams, adjusting brightness or functional use. The strap adjustments in terms of adjusting to head size with or without a hat, is also excellent. Again, I found the Black Diamond Storm headlamp very easy to use and operate. In terms of trail finding, it is great. I have not had any problems finding what I have been looking for and I can pick out detail from the map to match to land features in darkness.The peripheral or proximity reach of the lamp is great too so it is easy enough to pick out features on your sides as you hike by. Useful if you need to find something very specific in heavy darkness! The power tap function is good and works pretty well but, as referenced above, it seems to work better with gloves off. Not a major issue but something to mention. The Storm headlamp weighs 62g without batteries. It takes 4 triple A batteries to power it so you can add another 48g or so to that bringing it to a 110g in total. A very reasonable weight for my needs. The Black Diamond Storm headlamp is also waterproof to 1 meter for 30 minutes. In terms of hiking, good to know that the headlamp will still be able to perform in bad conditions like heavy rain or if you dropped it into a stream. The brightness on the Storm runs from a range of 4 lumens to a very respectable 250 lumens. Now, it is hard to say for sure how long the batteries will last when you move through different levels of brightness a lot. However, from my experience with the Storm, it holds its own pretty well when it comes to battery life. In terms of battery power, it takes 4 AAA batteries. The claimed battery life is 250 hours at 4 lumens and 60 hours at maximum capacity of 250 lumens. The batteries can be easily changed by opening the main lamp casing. The Storm also features a heatsink which warms the batteries to help preserve battery life by regulating them which in turn helps enable consistent lighting. The Storm’s customized housing is completely sealed from both dust and water (IP67: Waterproof and dust proof—Best for saltwater and extremely wet or dusty environments. Unit is completely sealed and tested to operate up to 1 meter underwater for 30 minutes. Requires no maintenance after submersion). It also features a secure latch closure, as shown in the picture below, which provides good protection from the elements. The casing is very secure and I have had to use a tool, like a knife, to help me open it! The claimed distance of the beam is 2 meters at 4 lumens and 80 meters at 250 lumens. I was comfortably using it for 60 to 70 meter distances so I won't argue with this. It sounds about right from my experience of it. As mentioned above, the burn time is also listed as 250 hours for 2 meters at 4 lumens and 60 hours for 250 lumens. This is only a rough indication as in reality you're always using different brightness, turning it up and down, on and off, etc. To try and give you an idea of how effective the beams are, I took to a country road late at night. In the photo below, the yellow square you see in the top middle of the photo is a road sign. It's at a distance of 80 meters from where I am standing with full capacity of the main single beam on, note I put fresh batteries in before I took the photos. In the next photo you can see the same set-up but with the second Double Power LED added, you can really see the extra brightness and visibility it adds. I have to say that I think the price for the Black Diamond Storm Headlamp is decent and offers good value for money. Prices continually change, so click on the link above to get an up to date price. The Storm also comes with a 3 year manufacturers warranty, see it highlighted by the red square in the photo of the back of the product box below, which is always comforting to have. It's worth noting the raft of other information that is provided on the back of the box by Black Diamond. Handy to have! In terms of hiking, I thing the Storm is a very functional choice for any hiker. There isn't any hiking or camping situation that I can think of that I wouldn't be happy using the Storm for. So, night hiking, backpacking or camping, the Storm has performed well for me in all circumstances. It's durable, powerful, lightweight and provides excellent visibility when out on the trail at night. It fits the bill and meets the needs of all of those situations as far as I am concerned. As of the date of this post, from about 140 user reviews across multiple sites, 75% of people gave the Storm headlamp 5 stars and 89% 4 stars or more! That's pretty impressive scoring and from my own personal experience with it, I am not surprised, I score it highly myself. Very bright with multiple lamp functions: main beam, proximity beam, red and green night vision lights, strobe, etc. Weight: 110g (Including 4 triple A batteries). The Black Diamond Storm headlamp is an excellent addition to my hiking gear. I've been very pleased with it and it has performed well for me for going on 5 months. I am very happy with more or less every part of the Storm although I think the tapping function could be improved on. The price is good for the quality you get. In terms of usability, it's easy to get the hang of it and use it on the trail, I love how you can operate every function via the main power button. It's functional capabilities are what I need and it's performance is what I would expect. Overall, I highly recommend the Black Diamond Storm Headlamp. If you're in the market for a headlamp for the trail, you could do a lot worse. If you're new to buying a headlamp, check out the head lamp buying guide which runs through everything you need to think about before buying one. I hope you found this review useful. Please comment and / or share it around your networks if you did. Do you use the Black Diamond Storm Headlamp? What is your experience with it? Hey Dom, great looking headlight. I do quite a bit of fly fishing and sometimes go out looking for sea trout at night. I have a headlamp as you need it to tie on new flies or work at tangles and such but it only has the red night vision option. I’m looking for a new lamp and am wondering are there any benefits to using the green night vision light as apposed to the red? Also do you know will it spook the fish any less? Any help in improving my catch rate appreciated. Thanks Colm for sharing this information. I found it really interesting. Until now, I have never considered a headlamp. I live on a farm and almost everyday I’m still busy on the farm with work to do when the sun goes down. I believe I just found my solution. While working, I need both of my hands to get the job done and I would find a flashlight useless because it involves me carrying it. With the headlamp its an hand-free device. I also like the fact that it is activated by touch. Once again, thanks for this valuable information and I will definitely refer to your website in the near future! Thanks Jorda. Wow, I would never have thought about using it in the context of farming 🙂 that’s cool. I can see how it would be useful for sure though. That is one of the main advantages of any headlamp, you have your hands free which enables you to focus on stuff as you need to. For example, in hiking terms your hands are free so you can work with your map and compass, or do what you need to as you would, more or less, in daylight. Also, wherever you look, the light naturally shines on the trail ahead as the lamp is fixed on your head. Same with any outdoor activity at night like camping, etc. and as you say, it would be a very useful aid while working in the dark too. Thanks for adding that in. Wow, what a great review, thank you so much for it, it was very detailed and you made it relatable so people can understand.